The included photos of Mozes Maurice Schonberg and Ernestine Esther Schonberg were used to complete the "Give them a Face" portrait collection (KD_00017) and the commemoration wall at the Kazerne Dossin museum ; Sami Schonberg was interviewed by the Australian Institute of Holocaust Studies in 1990. The audio interview is available on the USHMM website : https://collections.ushmm.org/search/catalog/irn43178 . Abraham Herschel Schonberg was born in Oświęcim, Poland, on 21 July 1881 as the son of Salomon Schonberg and Rachel Florenz. As a young man, he moved to Krakow where he became a diamond broker. On 17 December 1905 Abraham Schonberg married Victoria Ubersfeld, born in Cracow, Poland, in 1880, as the daughter of Salomon Ubersfeld and Ester Indler. Abraham and Victoria’s first child, a son named Alexander, was born in Cracow, Poland, on 15 April 1909. Ten months later Abraham Schonberg emigrated to Antwerp, Belgium, where the diamond industry blossomed. His wife and son followed on 27 January 1910. Three more sons were born in Borgerhout, Belgium : Mozes Maurice (b. 28/10/1910), Jozef (b. 18/09/1912) and Jacob Jacques (b. 03/01/1914). Due to the outbreak of the First World War, the Schonberg-Ubersfeld family fled to eastern Europe in August 1914. Their three youngest children were born there : Ruchel (b. 12/10/1915 in Eger, Austro-Hungarian empire, today Cheb, Czechoslovakia), Sami (b. 27/04/1917 in Olmütz, Czechoslovakia) and Ernestine Esther (b. 14/02/1919 in Olmutz, Czechoslovakia). 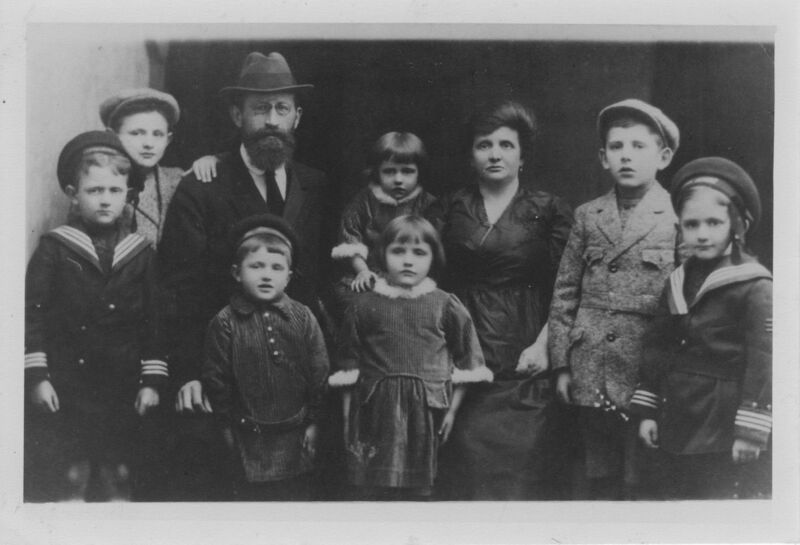 In November 1919, the family was allowed to return to Antwerp, Belgium. All members of the Schonberg-Ubersfeld family still lived in Antwerp when Nazi-Germany invaded Belgium on 10 May 1940. Oldest son Alexander Schonberg had become a diamond worker and, on 26 March 1940, had married Anna Sara Ubersfeld (b. 08/07/1920 in Vienna, Austria). In December 1940, the newlyweds fled to France. They settled in Bordes, France, until they were arrested in August 1942 and sent to the Gurs internment camp. On 28 November 1942, Alexander and Anna were transferred to Rivesaltes, where the couple was split up. Alexander returned to Gurs, was transferred to Drancy on 2 March 1943 and was deported to Majdanek on 6 March 1943 via transport 51. He was killed upon arrival. Anna Ubersfeld was interned at Elne, France, and as of May 1943 in Saint-Claude, France, where on 19 July 1943 her daughter Danielle was born. Mother and daughter were transferred to Lyon in January 1945 and were repatriated to Belgium in July 1945. Anna Ubersfeld settled in Brussels and remarried Joss Susskind. Her daughter Danielle Schonberg married Joseph Baranes, had children and grandchildren. Third son Jozef Schonberg, who was also active in the diamond industry, also fled from Belgium to France, probably in 1941. He was arrested not long after and interned at the Gurs camp, before being transferred to Saint-Claude and Lyon, where he perhaps was in contact with his older brother Alexander or his sister-in-law Anna Ubersfeld. Jozef Schonberg was then taken to Drancy from where he was deported to Kaunas (Ravel), Lithuania, via Transport 73 on 15 May 1944. Jozef Schonberg did not survive deportation. Of the Schonberg-Ubersfeld family members remaining in Belgium, only two would survive the war. Oldest daughter Ruchel Schonberg, her husband Chaim Juda Fajgenbaum (b. 29/09/1913 in Warsaw, Poland) and their son Sylvain Fajgenbaum (b. 22/10/1941 in Brussels, Belgium) were arrested during the anti-Jewish raid in Brussels in the night of 3 on 4 September 1942. None of them survived deportation from the Dossin barracks to Auschwitz-Birkenau via Transport VIII on 8 September 1942. Father Abraham Herschel Schonberg, his wife Victoria Ubersfeld and their youngest daughter Ernestine Esther Schonberg, a diamond setter, were arrested in Antwerp and taken to the Dossin barracks on 26 September 1942. None of them survived deportation via transport XII to Auschwitz-Birkenau on 10 October 1942. Second son Mozes Maurice Schonberg, a clerk, and his wife Paulina Spira were arrested in the autumn of 1942. Although Pauline was initially put to work at the Dossin barracks, thus protecting herself and her husband from deportation, the couple was added to the list of transport XVII. Neither survived deportation to Auschwitz-Birkenau on 31 October 1942. Fourth son Jacob Jacques Schonberg, a merchant, was deported to France in July 1942 and put to work as a forced labourer for Organisation Todt at the Dannes internment camp. He was able to escape, thus avoided deportation from the Dannes camp in October, was rearrested and survived the war as a prisoner in France. After the war, Jacob Schonberg married Sara Namenwirth. The couple had children, grandchildren and great-grandchildren. Jacob Schonberg passed away in 1985. Youngest son Sami Schonberg, who dealt in knitwear, was arrested in the summer of 1942 and was deported from the Dossin barracks to Auschwitz-Birkenau via Transport XVIII on 15 January 1943, but was able to escape from the train and survived the war in hiding in Belgium. After the war, he took care of his sister-in-law Anna Ubersfeld, widow of oldest brother Alexander Ubersfeld, and his niece Danielle Schonberg. On 5 July 1960, Sami Schonberg married Rosa Roth in New York. The couple emigrated to Australia and had three children, including Alain Schonberg, and multiple grandchildren, including Michal Schonberg. Sami Schonberg passed away in 1993. In 2010, Alain Schonberg, son of Sami Schonberg, and his nephew Michal Schonberg, grandson of Sami Schonberg, donated digitised copies of two family photos to Kazerne Dossin in order to complete the Give Them a Face portrait collection with photos of Mozes Maurice Schonberg and Ernestine Esther Schonberg, siblings of Sami Schonberg.